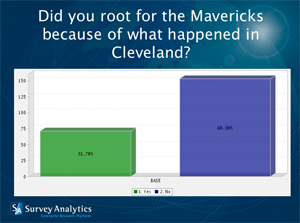 SurveyAnalytics Blog: NBA Finals - Why did you root for Dallas Mavericks? NBA Finals - Why did you root for Dallas Mavericks? I hope that you enjoyed the recently concluded NBA Finals series between Dallas Mavericks and Miami Heat. I think that the series was thoroughly entertaining and fitting of a NBA finals series. We saw Dirk Nowitzki rise from the the ranks of "choker" to a "champion". We also saw the spectacular failure of the big three James, Wade and Bosh after they were clearly headed towards a championship after the conclusion of three games with a 2-1 lead. What makes this a poignant loss is that just a few days ago LeBron had tweeted "Now or Never!" Of the respondents who watched the game, 68% said that they didn't root for Mavericks because of what happened in Cleveland over the last one and a half years. Despite the fact that Cleveland lost, it is interesting to note that 60% respondents like the duo of LeBron James and Duane Wade over 41% respondents that like the duo of Dirk Nowitzki and Jason Terry. 61% of the respondents were Dallas fans. Yesterday's results sets up for an exciting next year of NBA. We wonder if the big three will stay intact in Miami and whether the injured tigers will get over the hump to win a championship. We would like to thank all our participants for taking part in this poll, we are looking forward to bring more of these instant polls to you - so stay tuned.